The use of many clips and springs makes overhaul of the brake drum assembly very time-consuming. Because of the enclosed drum. asbestos dust is collected in the brake cavity and certain parts of the brake drum. Asbestos can cause cancer. Grinding brake lining and cleaning of the brake assembly can cause small particles of asbestos to become airborne. Always wear personal protection equipment. Dispose of waste material and cleaning rags as hazardous waste. For more information. see OPNAVINST 4110.2, Hazardous Material Control and Management. Figure 7-15. 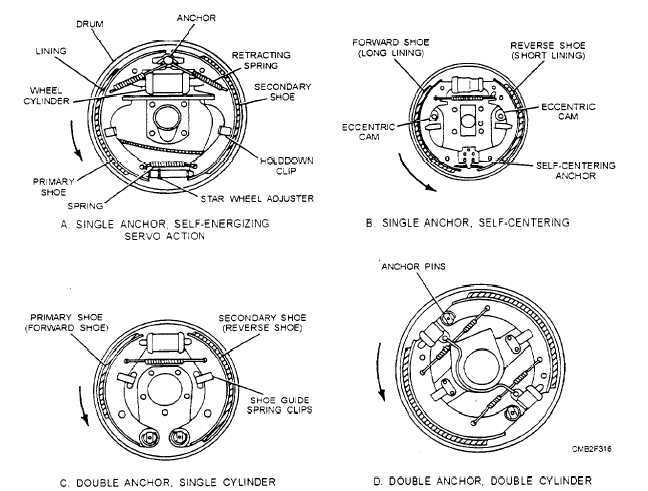 - Brake drum configurations. consequent marked reduction in the distance required to stop the vehicle. Braking with disc brakes is accomplished by forcing friction pads against both sides of a rotating metal disc, or rotor. The rotor turns with the wheel of the vehicle and is straddled by the caliper assembly. When the brake pedal is depressed, hydraulic fluid forcesthe pistonsand friction linings (pads) against the machined surfaces of the rotor. The pinching action of the pads quickly creates friction and heat to slow down or stop the vehicle. Disc brakes do not have servo or self-energizing action. Therefore, the applying force on the brake pedal must be very great in order to obtain a brake force comparable to that obtained with the conventional drum brake. Consequently, disc brakes are provided with a power or booster unit and a conventional master cylinder. In many installations, disc brakes are used only on the front wheels and drum brakes are continued on the rear. However, you may on occasion find disc brakes used on all four wheels.